We switched a bedroom for an office and Spratt construction built specialized closets with an abundance of lighting for my husband. There was electrical, painting, and construction. I pushed to have the work completed in two weeks. They left on a Friday at 4:30 in the nick of time to surprise my husband. We both are extremely happy with the job and it was completed to our perfection. We are now discussing the painting of the exterior of our home in the spring. I needed Spratt Construction to remove wallpaper in a small sunroom, paint the ceiling and walls, and refinish the sun baked window sills. The painter arrived promptly at 8:00 A.M. Monday morning and began working. Mr. Walker was on the job on time every day he worked for me. Mr. Spratt or Mr. Boring would stop each day to check on the progress of my job. Mr. Walker finished the job perfectly. The ceiling, walls, and crown molding have been painted to my satisfaction and, again, I am one happy camper. Midwinter, I hope to move my office to the newly refreshed sunroom and have the old location repainted and turn it into a bedroom. 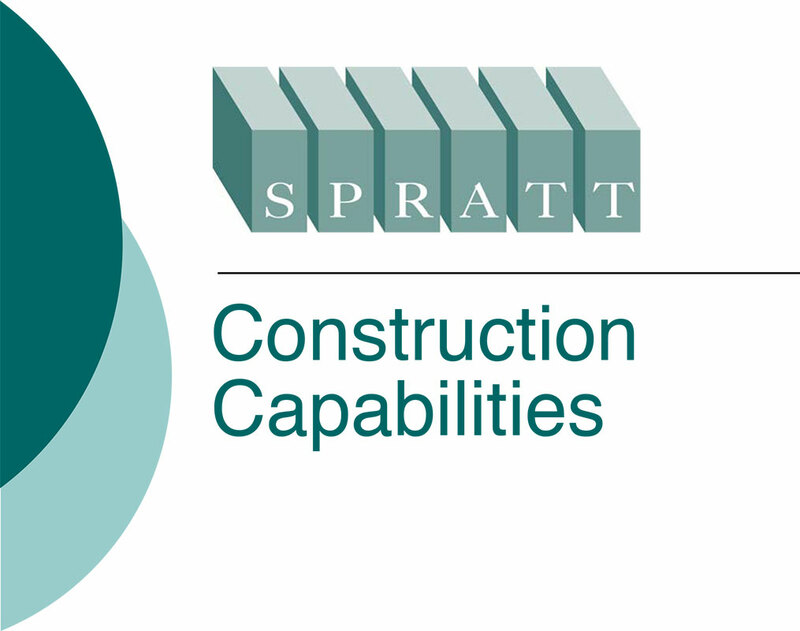 I will be using Spratt Construction again. Spratt Construction began when they said they would and the work proceeded faster than I had planned. I had cabinets refaced in the kitchen, new window and door trim installed, new granite tops which replaced outdated Formica, new hardware, new electrical rewiring, and removal of old wallpaper which led to kitchen walls being totally repainted. My out dated pantry was gutted to the shell and new cabinets and shelving were built to fit. The job proceeded quickly and neatly. I am a very happy customer. My husband and I are architects and partners of our firm curb. We first retained the services of Spratt Construction for a project that we are the owners, architects, and developers. We have subsequently referred Spratt Construction to our client (who hired Spratt Construction to construct a new residence) and to other architecture firms and owners seeking contractor referrals. For the project that we are the owners, architects, and developers, Spratt Construction provided cost estimates (based on drawings we provided), and built two new houses (one duplex and one single family house) from the ground up. Because of our own budget limitations, the duplex was fully completed and the single family house was completed to the point of occupancy but with items remaining to complete on a phased schedule. We continue to hire Spratt Construction to complete the later phases of the project as we are able, and as Spratt Construction can work us into its schedule. Our experiences with Spratt Construction, and company owner Jack Spratt, have been excellent. Jack Spratt’s great strength as a contractor is his openness and honesty. We never have to worry about whether he is trying to pull the wool over our eyes. Spratt Construction estimated our project carefully and thoroughly, using drawings and specifications we developed. On this basis, we signed a cost-plus contract. Spratt Construction provided us clear invoices at regular and agreed upon intervals. The invoices included a summary sheet and detailed receipts to explain costs for labor and materials. They reflected agreed upon overhead and profit. Invoicing was transparent and fair. Circumstances outside of Spratt Construction’s control (poor soil conditions uncovered during excavation and previously unknown) required us to revise the project budget, scope and schedule almost immediately. Spratt Construction helped us evaluate our options and together we developed a new budget, scope and schedule goals in light of these circumstances. This entailed phasing the two structures. The first structure, a rental property, had to be done by a set time in order to meet rental commitments and financial constraints. This portion of the project was completed on time to meet these deadlines. Equally important, it resulted in a project we are thrilled with – and one that has won numerous design awards and has been published in national design magazines. The project quality is excellent and after five years of rental use, it is wearing quite well. The second structure, a single family house, was completed next to a level that allowed issuance of the certificate of occupancy. Again, Spratt Construction worked with us to meet our financial and move-in goals and to adjust the scope of work to fit within our budget constraints due to the soil remediation costs we encountered in the first phase. We continue to work with Spratt Construction and his crew to complete ongoing interior and exterior phases of this house. This project has also received design awards and has been published. Spratt Construction, Jack Spratt, and the on-site superintendents he employs, respect the role of the architect and appreciate a job well done. Though they are happy to discuss constructability or provide feedback on design options, they don’t second guess the design and, in fact, will refuse to provide design input for clients who request it. This makes for a very clear division of labor and creates complimentary expertise on the project team. They pay attention to the drawings and specs, ask questions when they do not understand or something is not clear, and work with us (as the owners and as the architect) to ensure the project meets our expectations. They are quick to address areas that do not quite match what we intended; they take responsibility for making changes when it is their responsibility and are good at communicating with us to resolve places where we share responsibility for corrections. They are particularly unique in this area – a testament to their character and conscientiousness. Because of this first experience, we continue to call on Spratt Construction, and to recommend Spratt to other friends and professional colleagues in the architecture community. 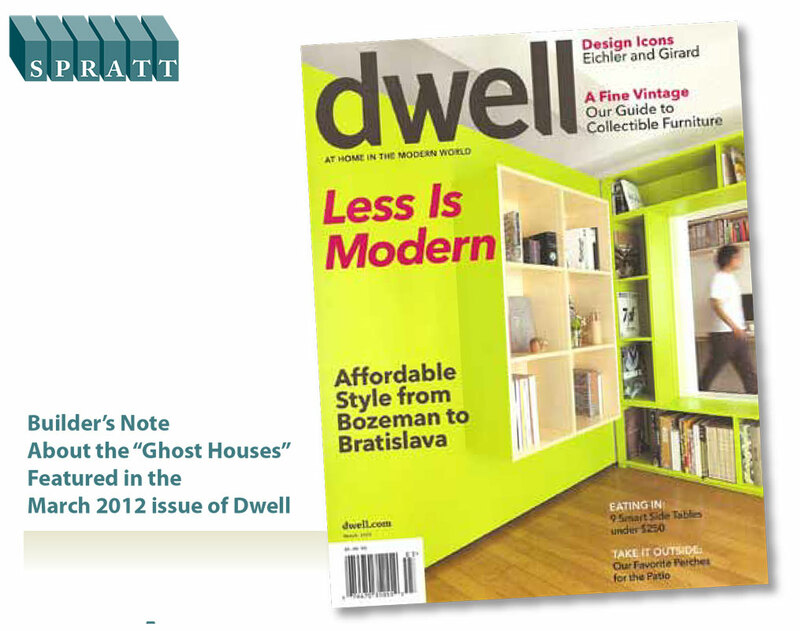 We enjoy working with Spratt Construction immensely. Spratt Construction oversaw various repairs to our house that were made necessary by a pretty serious hailstorm. A new roof was the biggest part of the project. It was a rather complicated job for which Mr. Spratt helped us choose materials and sub-contractors. He then oversaw and coordinated the work done by the several subcontractors. His own crew also did considerable work on the project, as well as some repairs and upgrades that were not made necessary by the storm. Mr. Spratt was great to work with and kept the project moving along nicely. Billing was accurate and transparent and Mr. Spratt’s standards for work were high and consistent. He demanded that work and materials be of a high quality. He also recommended against some possible repairs that would have made him more money and watched out for our money as if it were his. I have recommended him to friends for renovations and new construction and will do so in the future. Jack Spratt has done remodeling for us on at least five previous jobs. The quality of his work is second to none! The last project Jack performed for us was a basement remodel which involved extensive plumbing, electrical, and wall rearrangement. The entire basement area was re-purposed. This involved installation of two new bathroom areas. There was extensive tile work and custom cabinet construction. All work proceeded without a hitch. Jack himself came by practically every day to inspect that day’s work. He has a wonderful crew that is more than happy to meet the customer’s needs and answer questions. I never hesitated to leave the crew alone in my home while I ran errands. Our history with Spratt Construction has been a positive one. Jack and his crew are creative and responsible. We have a couple more jobs for Spratt Construction and when completed, they will have remodeled our entire 40 year old house! I highly recommend Spratt Construction for home building and remodeling. Spratt Construction has been our go-to company for many years, including a difficult under-the-existing-house master suite constructed very successfully 6 years ago. This time, however; was an unplanned mold problem in our crawl space due to some destructive raccoons! There was so much moisture and mold structural work was required, the HVAC was demo’ed and replaced and the insulation replaced. All within a few days! The work was performed quickly, accurately and with minimal disruption to our lives. Mr. Spratt was extremely knowledgeable as to the “fixes” required to alleviate the problems. We have hired Spratt Construction in the past and will in the future.